So effortlessy chic! I can't believe those trousers are from H&M. They look like such great quality. You look amazing and your lipstick is GORGEOUS! Those camel trousers are FABULOUS and I seriously love the detailing on that necklace. So cute as usual. I love the colors and of the hat and sweater. Those shoes are fierce. And the lip color seals the deal. You look amazing! <3 this outfit! Great outfit! Love the colors and it's very well put together. i love all the layering and the colors are fabulous! i'm gonna have to try out that lipstick too! Preppy pretty! This is a very cool look for you here, Khatu. Don't really have a specific favorite garment of this look; just like the whole deal here. I love these bold colors! Your pretty yellow beret is to DIE for. 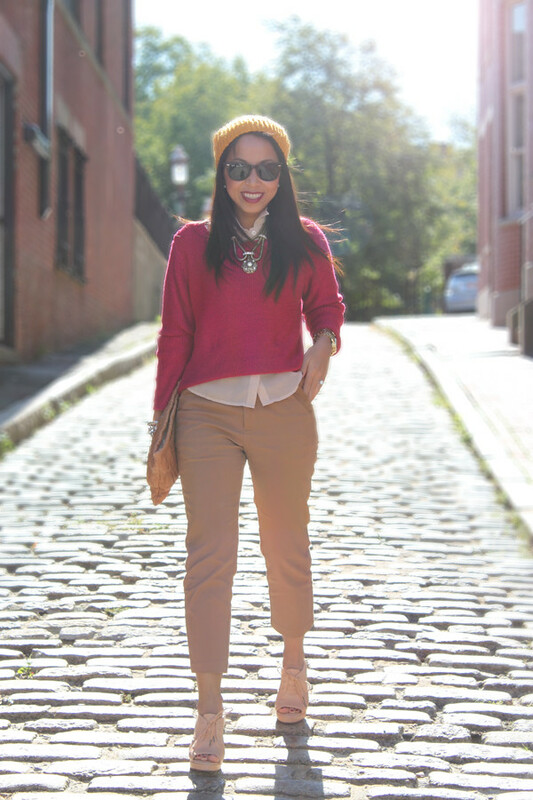 Another fab look, Khatu! You do color like no otha'! ;) And those wedges... I sorta need them in my life. I wonder if it will look weird against my tan skin?? hmmmm. Oh! You look so good! The colours, the combos - perfect! And love that lip colour on you. oh so Chic!!!! loving it and copying it. x! Mustard beanie! I love it! This outfit is so cool - it's so colorful, it makes the Fall season look not as dreary ;) I really love your prada clutch too! Thanks for sharing! I love the fall colors in this outfit. So vibrant! love this look and great pics location!! This is so pretty! You play with proportions so well, I could never put something like this together :) And the location is gorgeous as well! This is the ultimate in chic, yet relaxed weekend wear. Show me thy ways, darling. You look great in that beanie! Awesome shots! love the colors in this outfit - esp. that hat!